. . . Into the Hands of Sinful Men. I love the idea that by saying, “This is my body . . . This is my blood,” Jesus made sure he would be present to us all the time. I’ve always loved the way that the Last Supper foreshadows the cross: in both cases, Jesus gave himself into the hands of sinful men so that he could lift them up to be with him. I find it moving that Jesus continues to give himself to us—sinners though we are—every time we come together to celebrate Mass. Now, before we get to all the autism stuff, do me (and yourself) a favor. Let this thought sink in for a moment: Jesus continues to let sinful, conflicted, duplicitous, envious, lustful, bitter, [insert sin here] people take him into their divided hearts. All this was in my mind on Thursday as we entered the church. I was really looking forward to a deeply meaningful, spiritual experience at the church. But alas, it was not meant to be. A couple of our kids had had a rough day at school, and they brought their agitation with them to church. One had forgotten to take her ADHD medicine, so she couldn’t stop chatting with Katie, fidgeting all over the place, and trying to engage her brothers. Another was worried about a difficult test that morning, and his anxiety worsened as the Mass went on. A third just plain didn’t want to be there, and he made sure to let everyone know it. So there I was, trying to keep the kids from boiling over, trying not to distract the people around us, feeling more than a little uncomfortable with the way we stuck out, and feeling cheated out of my time with God. Jesus has given these children to me. He has placed them into my hands. He knows what kind of person I am. He knows my weaknesses and my faults. He knows my selfishness and my lack of generosity. He knows my impatience and perfectionism. And still he saw fit to give me six kids with special needs. Six kids who would need extra attention. Six kids who would need a creative, flexible approach to parenting. Six kids who would need extra love to help make up for the world’s lack of understanding and acceptance. I saw this right there in the middle of Mass. These kids are also the body of Christ. They are all signs of God’s beguiling creativity. They’re signs of his maddening ability to call forth the better part of my human nature while at the same time exposing my darker parts. They’re sacramental signs who both symbolize God’s mystery and impart his grace to everyone whose hearts are open. In the midst of their everydayness, their struggles, and the occasional banality of their lives, there is something sacred about my kids. Like the Eucharist, their simple, unassuming appearance belies their wondrous complexity and depth. And like Jesus himself, they are a sign of contradiction, especially in the way their place on the autism spectrum evokes extreme reactions, both positive and negative. Yes, they are the body of Christ, and God has placed them into my hands. Just as Jesus is placed into my hands at every Communion line. I don’t know that I would take such a risk if I were God. There are a lot of men who would do a lot better at this than me. But then again, God seems to be in the risk-taking business. Again, it’s like the gift of his Body and Blood in the Eucharist. Jesus knows the risks involved in giving himself to us. He knows that not everybody will accept him with the right state of heart. He knows that nobody will ever grasp just how awesome this gift is. But none of this stops him from offering himself to us. Over and over again. In love and humility. For our sakes. At the Last Supper, Jesus told his disciples, “If I have washed your feet, you ought to wash each other’s feet.” He also told them, “Do this in memory of me.” He says the same thing to me. Every day. Through every one of my children. In every challenge and melt down and IEP meeting and therapy appointment and sensory overload. Do it in memory of me. And all I can do is stand in wonder that he trusts me so much. Just this morning, I came across a story written by Paul Gondreau, a theology professor at Providence College in Rhode Island. He and his family happened to be in St. Peter’s Square in Rome on Easter Sunday and were present when Pope Francis toured the Square in his popemobile. 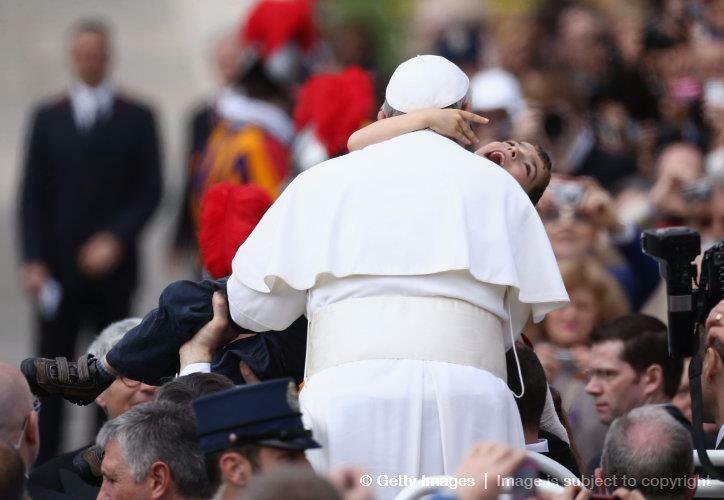 The picture you see here is of the pope embracing Gondreau’s eight-year-old son, Dominic, who has Cerebral Palsy. In so many ways, the picture speaks for itself. But Gondreau’s brief article on the event makes a couple of moving and important points. First, he relates a comment that a woman in the Square made to his wife afterward: “You know, your son is here to show people how to love.” Gondreau talks about how this comment turns our everyday thinking on its head. Parents of children with disabilities are called to give more than the usual amount to their kids: more help, more guidance, more advocacy, more money, more time, more therapy, more of everything. And we often focus on all that we have to do or all that we have to give. But what Pope Francis highlighted—and what Gondreau picked up on—was how much our children give to us. While we’re busy giving our children all they need, they are busy giving us huge lessons in what it means to love. They’re teaching us how to give and give and give—not by demanding it of us but by drawing it out of us. Just as Jesus gave himself for us not because we stormed heaven and demanded our rights but because his heart warmed at the sight of us, and he couldn’t help but become one of us and share in our pain and need. Second, by framing the whole thing in terms of a vocation, Gondreau finds a way to answer the “why” question that every parent of a special-needs kid asks. Why did this happen? Why him and not someone else? What did he (or we) do to deserve this? In my very first post on this blog, I wrote that asking “how” is far more helpful than asking “why.” Well, I’m not so sure any more. I think you need to be working on the “why” if you want to know “how.” And to say that it happened because God wanted more professors in the art of love is clearly one very encouraging, hope-filled answer. Of course, that raises the possibility that God actually gave your child autism or cerebral palsy or some other genetic disorder. In fact, it almost pushes you toward that kind of conclusion. I don’t want to get into that really thorny question here (perhaps later), but my own experience tells me that when I look upon my kids—specifically with their challenges and disabilities—as God’s gracious gift to me and to the world, my heart softens. I find more patience, more peace, and a renewed willingness to fight for them. 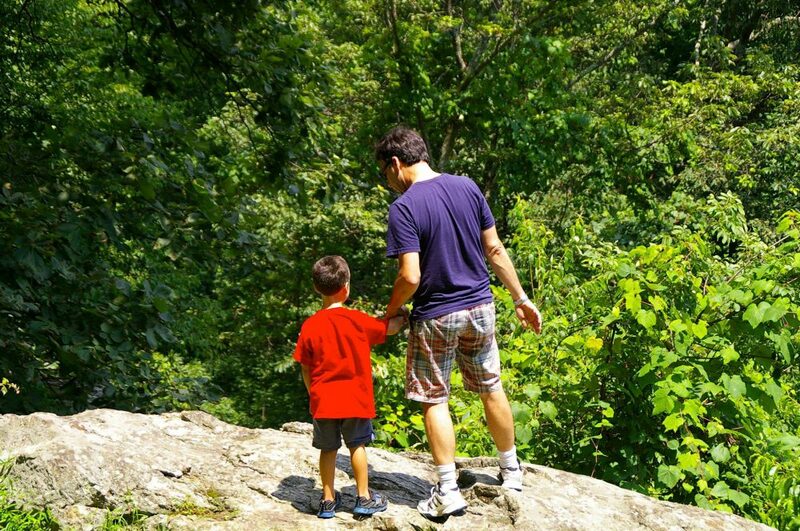 I find myself, too, looking upon other people—especially those who don’t get my kids—with more kindness and compassion. Bitterness recedes, and fear diminishes. Hope grows, along with a little more wisdom and clarity on how to proceed through each challenge that we face. Early in his article, Gondreau referred to Mother Teresa of Calcutta, who talked about performing “small acts with great love.” That’s one way into this vocation. But I like another saying of hers even more. She called it the “Five-Fingered Gospel.” Carefully counting out each finger on one hand, Mother Teresa would tell people, “You. Did. It. To. Me.” Everything we do, especially for the poorest and most vulnerable and most needy among us, we are doing to Jesus. She spoke often of meeting Jesus “in the distressing disguise of the poor.” For her, that was the heart of the Christian message, and I’m beginning to agree with her. I can’t tell you how helpful it is to know that in caring for my kids, especially in the midst of a huge melt-down or in some other difficult moment, I have the privilege of meeting almighty God. If my heart is right and my mind is clear, I imagine myself caring for Jesus at that moment, just as people in the gospels washed his feet; wrapped him in swaddling clothes; and took his exhausted, wearied body down from the cross and laid it in his mother’s lap. None of this diminishes the pain and the difficulties, of course. But maybe it will help us learn how to love and accept the situations we are in rather than try to run and hide from them or get swallowed up in anxiety or anger. Imagine the kind of world it would be if the least and the most challenged among us were treated as gifts and not glitches—as prophets and not problems.